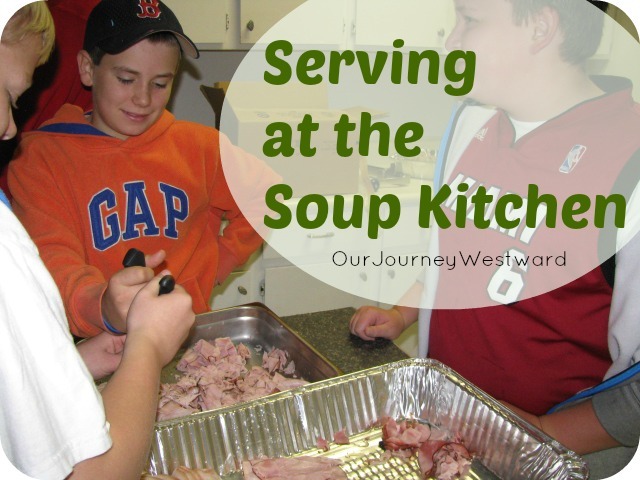 Most towns have at least one soup kitchen that reaches out to the homeless or less fortunate in the community. Call or stop in to offer the services of your family. (They like advanced notice, so don’t just show up ready to work. Make an appointment.) Most soup kitchens will take volunteers of all ages, so plan to bring anyone over the age of six along. What can you expect? You’ll likely arrive early to prepare food, set tables, and pour drinks. When the guests arrive, you’ll take part in serving them food, refilling drinks, collecting trash and, hopefully, talking with these precious people. That’s the best part: sharing in each others’ lives for a few minutes. After the guests leave, you’ll get to clean up the mess, and maybe even grab a quick bite from the leftovers. By the end of your few hours spent at the soup kitchen, you’ll be changed. Your heart will be bigger, your gratitude will multiply, and your family will be begging you to schedule another trip to the soup kitchen. Submitted by Cindy West, an eclectically Charlotte Mason homeschool mom and author of the popular NaturExplorers Studies and Homeschooling Gifted and Advanced Learners at ShiningDawnBooks. She blogs about homeschooling, life, and faith at Our Journey Westward and would love to meet you there!